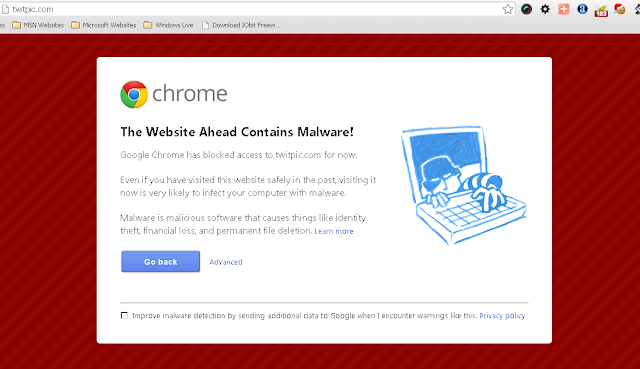 Suddenly today Google Chrome start detecting Twitpic.com as malware threat. Twitpic is one of the most popular website for Sharing photos and videos on Twitter. Twitpic denies and said that there is no malware on the website and is trying to contact Google. We also notice that, Twitter profiles and pages with Twitpic URL in tweets are also blocked curretly by Chrome. Many people also complaining about this on Google Help forum. An official statement from Twitpic via tweet,"Working to fix the google chrome malware notice when visiting Twitpic.com as this is not true or the case, trying to contact google". Google's Safe Browsing Diagnostic page for twitpic.com saying, "Site is listed as suspicious - visiting this web site may harm your computer. Of the 12029 pages we tested on the site over the past 90 days, 0 page(s) resulted in malicious software being downloaded and installed without user consent. The last time Google visited this site was on 2012-12-30, and suspicious content was never found on this site within the past 90 days." Also Google report said,"No, this site has not hosted malicious software over the past 90 days. In some cases, third parties can add malicious code to legitimate sites, which would cause us to show the warning message." There are no further information yet available, we will update you soon !